1) Go to Settings -> Speed-up Addons menu in the app. 2) Copy the URL displayed on the page. 3) Paste the URL in the head section of your store’s theme.liquid file. Note: The speedup URL should be added before the closing of the head tag </head>. How the addons load speed is improved by adding speedup script in the theme? By default, Shopify loads the app’s script asynchronously i.e. after finishing the page load. As a result it takes a few seconds to load the addon products. 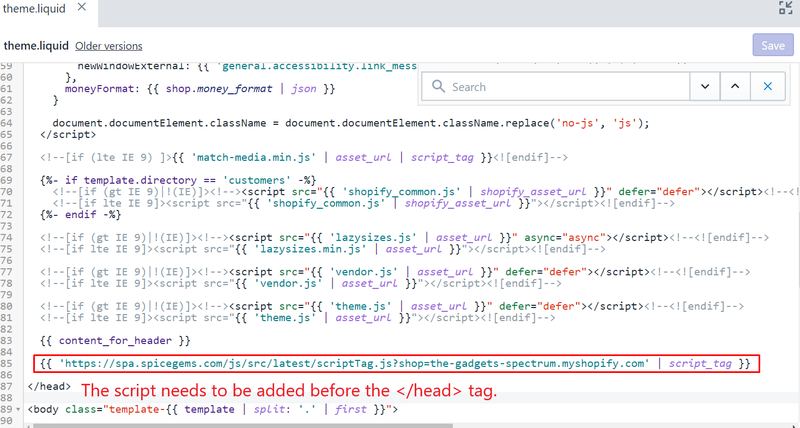 So once we paste the app js (script) in the head section of the store’s theme, the add-on products will load as soon as the page starts loading. This will result in notable decrease in the load time of addon Products. *Please refer to the video tutorial to install the speedup snippet.